Looking into your hamster's habitat and finding her shivering can be disconcerting, and rightly so. You may assume she's cold, and that may be the case. She may be suffering from illness or may be fearful. Learning to notice subtle changes in your hamster's behavior can save her life. Your fur baby may be shivering because she's cold. It's an involuntary action that helps warm her body. Hamsters are extremely sensitive to cold. They belong in a habitat that's between 65 degrees and 75 degrees Fahrenheit. You can adjust the temperature within this range, such as lowering it at bedtime, but never let it fall below 65 degrees. Further responsibilities for keeping your pet warmed are ensuring the hamster has ample clean bedding and a plastic burrow hut in which she can stay nice and toasty. The hamster will stuff the burrow with bedding so that it holds in her body heat. Shivering can the result of a cold or an upper respiratory infection, both of which can be deadly untreated. 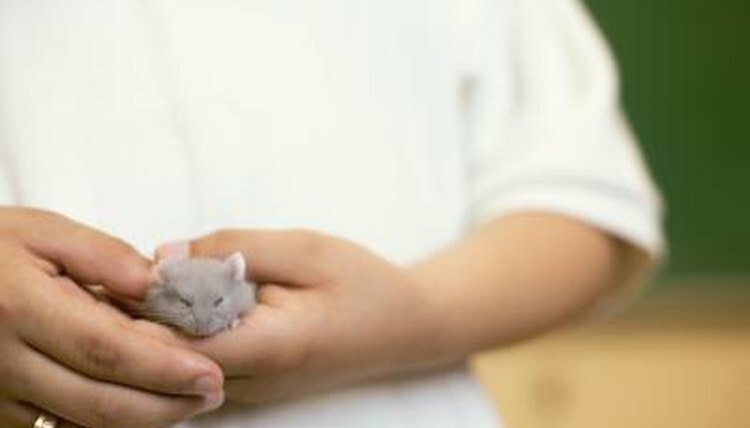 If you notice your hamster sneezing, coughing or wheezing, or that she has watery eyes and a runny nose, she's likely either sick or is having an allergic reaction. Clean the cage and furniture thoroughly, and use another type of bedding, such as recycled paper bedding. If the condition is a result of allergies, the hamster's symptoms should improve. When you watch a scary movie or hear a noise in the middle of the night, it probably sends a shiver down your spine. The same is true of hamsters, with exception of scary movies. Hamsters may become frightened by noises or commotions, or when they smell a predator such as a cat or a snake. Because hamsters have poor vision, it's easy for them to become scared. If fear is the cause of the shivering, the shivering should not be a continuous occurrence. Determine the cause of the fear so that you can eliminate it. For example, if your hamster is afraid of loud noises, move it to quiet room. If a cat is the problem, place the cage where the cat can't access the cage. If the shivering continues, it's time for a vet visit. Hamsters who shiver continuously, despite the habitat being at the right temperature and the bedding being fresh, more than likely have a cold or upper respiratory infection. Veterinary care is required. Without proper care, colds and URIs are deadly to hamsters. The vet will prescribe an antibiotic to treat the symptoms. Do Dwarf Hamsters Tolerate Cold?